Discussion in 'Plug-in Vaporizers' started by DieHard, Nov 14, 2014. Is there any competitor that actually uses SiC or Saphire but without a metal dominated vapor path? 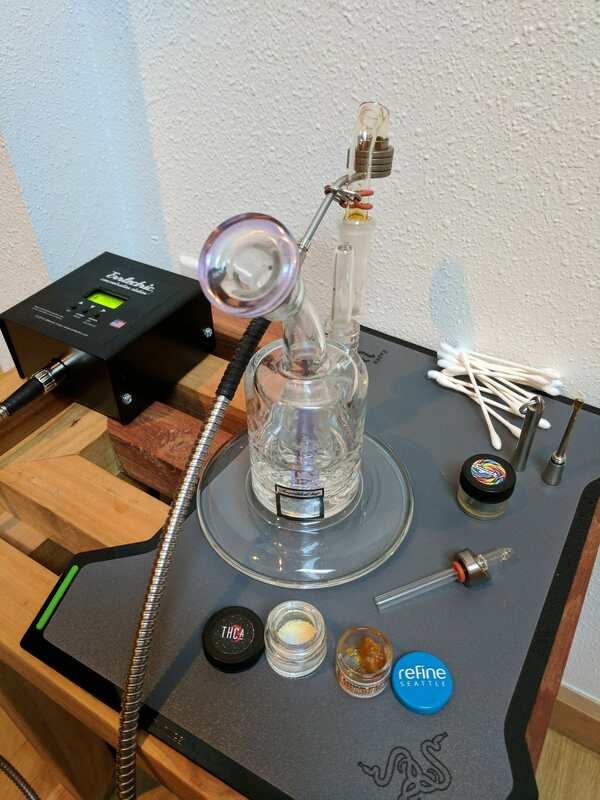 The best I've seen is the Liger which at least offers a decent sized Saphire crucible. However, still far too much metal for my taste. The Dnail dish style insert isn't a design I could ever see myself migrating too after using the FQN on the Errlectric. Morty, DieHard, SSVUN~YAH and 1 other person like this. That's a good point, I like the way you're thinking. I dream of a machined quartz Showerhead + bowl with zero metal in the path at all. it would be cool to see the FQN updated to a bubble cap style banger with the flat top. Morty, DieHard, elmoe420 and 1 other person like this. A recent Errlectric shot to share. Morty, vapirtoo, DieHard and 4 others like this. Hey folks been away a bit , but I'm happy to see my daily driver is getting some love. My herb nail temps have ranged all over the place depending on my mood. turn up the heat to 800 and have at it! Yo elmo420, great pix, really crisp. What cha using! Morty, SSVUN~YAH and elmoe420 like this. That is just a point and click off a Pixel 1 XL phone. Amazing how good these phone cameras are now. The real goodness though is that Refine Seattle live resin + Sticky Frog THCa isolate. What a cocktail!! Morty, SSVUN~YAH and vapirtoo like this. 800c. with some gorilla glue- whitewall the bubbler, one easy toke and I've arrived! Morty, SSVUN~YAH, lazylathe and 1 other person like this. This might be a dumb question but does anyone know of a adaptor so XLR type (5 pin) enails can be used with Errletric controllers? Errlectric adapters are proprietary to their control boxes. I am sure you could remove their connector and solder on an XLR but then you lose all the functionality of the package! Might as well just go with a regular enail or a Liger. Morty and SSVUN~YAH like this. Morty, lazylathe, DieHard and 3 others like this. Id say the Dnail metal air path is a good bit shorter than a Ligers (condenser + joint), but yeah, I don't know of any that uses, or now that Im really thinking about it, would use anything but metal at this point, I think the people that can REALLY tell the difference between 2-3cm of air path being metal vs anything else.....are gonna be rare cats indeed. Im curious as to which ways you find the fqn superior? I have all 3 setups mentioned and while I truly, truly....love my errl, Its pretty much bested in every possible metric I can think of by both Ligers and D-nails.....aside from possibly the advantage of the only "tweaking" needed to dial in an errl setup ia temps as most everything else has been removed from the equation. Id also add that although it may be the preferred manner of attaching the heater at current.....the Oring and hook setup, lets be honest, has always been pretty janky...even at its best, IMO even the quartz insert for just the errl ti nail is far superior.....but as I hinted before, I guess I'm not one of those cats that can tell the difference in air path so maybe Im missing something. Morty, SamuraiSam, SSVUN~YAH and 1 other person like this. I was probably first to complain about the FQN o ring retainer. That said after over a year it still works great. I also have a second FQN which I use a piece of vape wire to wrap it up. I honestly find the o ring works better than i ever expected. It can survive more heat than is created in the area it is used for. If it touches the coil it will melt but I have not had that happen. Morty, lazylathe and SSVUN~YAH like this. I think the people that can REALLY tell the difference between 2-3cm of air path being metal vs anything else.....are gonna be rare cats indeed. Probably, that said, I know I'd prefer zero metal in the airpath just on premise. I think people mostly just want to watch their oil boil though. A little while back I needed a new quartz nail from errlectric,..they sent it,..with no O rings,..just the nail. When I attached it the O ring was way too big for the nail,..I thought the nail was a defect because the arm sat way different than my old nail. I emailed them and they sent me 2 new O ring fasteners,...to my surprise they 1/3 the size they were.,,,so obviously they changed some specs on the nail...it’s also about a 1/2 shorter. SSVUN~YAH and DieHard like this. I have 2 FQN nails, purchased some time apart. They are definitely different. The differences are slight between mine, but the fit on the coil and nail still good. I have to wrap the o ring differently or give it a couple of twists before wrapping to shorten it a bit. I really do love my errlectric...I think the box is amazing and 3 year warranties on coils cuts out the extra anxiety of it burning out anytime soon. Yea it would be nice if nails and things were more updated to today’s sizes and materials and whatnot but I can milk my glass up at 550 easily..I can’t really say that for my liger experience or my halos. I use the fqn w/ a mobius cap and it’s a perfect match...I’m at temp quick w/ zero fluctuation. ....I suppose I could make my dabs smaller,..or pull softer but i think I might see if I can have a couple quartz nails made up with more travel coming off the bucket and perhaps a widened lip area to get in there easier. Just need to find a nail Smith I guess. SSVUN~YAH, Morty and DieHard like this. I will be down if you find that nailsmith! I would love to get some different Quartz for my fqn coil. ensabbahnur and SSVUN~YAH like this. I had DC Glass make me a custom quartz nail with the arm to hold the coil. I sent him the coil so he custom fitted the coil and quartz together. Plus it was a 30mm. lazylathe and SSVUN~YAH like this. @_bradleymiller_ on Instagram has just started selling Quartz bangers im gonna see if I can get a flat top fqn made. Update**-- I have contacted him and will work with him to make a flat top to fit my fqn coil. ensabbahnur, SSVUN~YAH and EVlL 55 like this. Much love to the Errl DHN. Had a session with her last night and solidified its place in my collection. Truly a keeper, very unique. I'm giving love today to the desktops that make it through my keeper test from last night. DieHard, vapirtoo, ensabbahnur and 1 other person like this. How did this turn out? I'm very interested in getting a larger FQN that mates perfectly with the Errlectric coil if possible. As other have pointed out you need to use a small amount of concentrate to avoid drips down the stem of the standard FQN. While this is actually somewhat helpful in preventing me from overdoing things, it would be nice to have a deeper design. SSVUN~YAH and ensabbahnur like this. I have not been able to get together with him. He is near me but I have been so busy with work. No worries bud, I know how that goes! Keep us informed though as you work on this project, thanks. I am unable to find any concentrates in our new area, so have decided to let my Errl go. It is a 240v model, so anyone in Europe/UK please PM me if you're interested. Any cleaning/maintenance advice for the Full Quartz Nail? I have dry q-tips to clean afterwards. After a long session, I'll remove the heater and use Higher Standards ISO to clean it with dipped q-tips. I want to find consistency with taste when keeping it clean.